Archie Manning has opened a new restaurant in New Orleans, aptly named "Manning's a Great Place to Eat, Drink and Cheer." Manning's is a 210 seat restaurant connected to Harrah's Casino with a separate entrance on the Fulton Street Mall. Besides food and drink, Manning's will has a retail shop with items branded with the Mannings' insignia. The restaurant features rotating memorabilia from New Orleans’ favorite sports family, including personal family photos, football jerseys, and helmets. There is also commissioned artwork by local artist Terrance Osborne, a sports anchor desk, more than 30 flat screen televisions showing the top sporting events and concrete walkways marked with yard lines. Manning's is a casual restaurant in which you will be comfortable in either jeans and a tee shirt or something more upscale. The restaurant is divided into different sections. 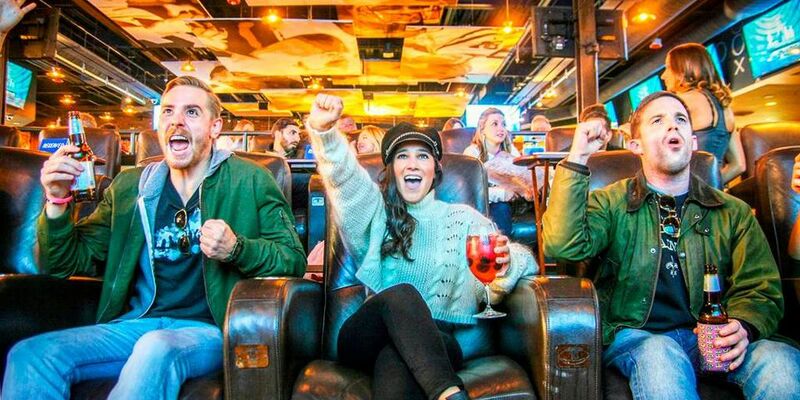 The End Zone is the best seat in the house with 17 leather reclining chairs set up in stadium style and complete with a fully functioning sports anchor desk. Strategically located in front of a 13 x 7 ½-foot flat screen TV, this area will allow for live pre-, post- and game day coverage featuring local and national sports personalities. Advance reservations are required for this section. Archie's Room is a smaller, more intimate dining space for up to 12 people. Much like the restaurant, this is filled with memorabilia from the Manning family that is unique to the restaurant and family. The Courtyard is an outdoor dining and entertainment area. The 4,000 square foot space with views of Fulton Street Promenade, is perfect for conventions and private parties. The Stadium Club, located on the second floor of Manning’s, is a large dining space including its own fully operational kitchen and wrap around balcony with overlooking views of New Orleans’ Warehouse District. Of course, no matter how special a restaurant may be, in New Orleans, it's only as good as the food. Manning's passes that test. Archie has brought in New Orleans-born Chef Anthony Spizale to create a menu that has something for everyone. Archie has a hand in the menu by paying homage to his roots with a menu that offers New Orleans-style food with a Southern flair from his home state of Mississippi. Signature dishes like burgers bearing the title of Manning’s former football jerseys; a Cast Iron Skillet Fried Filet topped with a Southern Comfort pan sauce; Oysters “Rockefeller” Spinach Salad finished with crumbled bacon, Gruyère croutons and herb vinaigrette; and a Beer and Cheese Bisque using locally brewed Abita Beer. There's also a kid's menu and a good wine list and some very special signature cocktails. The average cost per person is about $20.00. For more information, or to make reservations see their website or call 504 593 8118. Manning's is the perfect place to start a football Sunday, an evening of fun at Harrah's Casino or celebrate your winnings after. If you have the kids with you, just enjoy the Fulton Sreet Mall before or after dinner at Mannings.